Located 40 nautical miles north west of Kawthaung, High Rock is often the first dive site visited on a Burma liveaboard safari as the closer islands are out of bounds to dive boats. It is a small limestone rock and is very recognizable by the single tree on top and is a wonderful appetizer to what Burma diving has to offer. 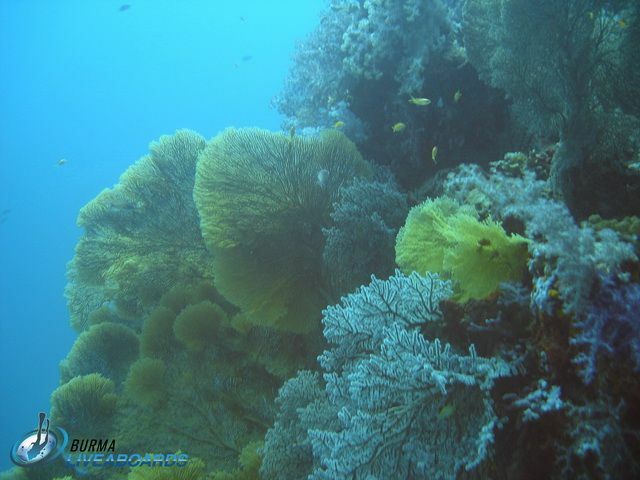 Underwater the north and east sides is mainly vertical wall diving whereas the south and west sides is sloping boulder and coral reef. Marine life on High Rock is very dense with large schools of fish covering the reef walls including blue and yellow snapper, fusiliers, Forsters barracuda, schooling bannerfish and several wrasse species. Silversides move as one in and out from the wall and can engulf divers as they flee from raiding trevallies. Triggerfish, leatherjackets and flute fish are also common along with puffer fish, freckled porcupinefish and lionfish. Bearded scorpionfish number in the thousands so touching the reef anywhere is not a wise move. If the scorpionfish don’t get you a long spine sea urchin might. Moray eels are everywhere including white-eyed, fimbriated, giant and yellow margined varieties. Often more than one species of moray can be seen occupying the same hole. High Rock has some old fishing nets on the reef which has now become encrusted into the coral in places but should still be treated with care to avoid entanglement. It is worth having a good look over the nets though as they seem to be a popular home to yellow tiger tailed seahorses who curl their tails around the nets. Under coral ledges on deeper parts of the reef it is possible to see white tip reef sharks or nurse sharks. Coral includes red finger soft coral and orange cup corals plus gorgonian sea fans, crinoids, zigzag clams and encrusting sponges. Night dives are particularly colourful here when the orange cup corals open in a brilliant display of colour and thousands of hingebeak shrimp (Dancing Durban shrimp) eyes reflect back from torches. Giant hermit crabs, long hair hermit crabs, sponge crabs and decorator crabs are all going about their business. The white antennae of painted rock lobsters give away the crustaceans locations. Banded boxer shrimps are numerous, often found cleaning moray eels who are more active at night time. Visibility at High Rock can be as high as 30m but is usually lower, around 10-15m. The maximum depth is 30m. Currents can be strong here and there are no mooring buoys. A quick descent may be required, this is not a dive site for beginner divers. Maximum depth is 30m.